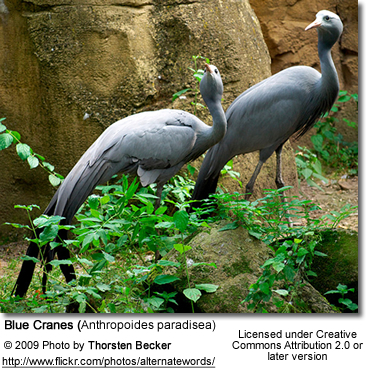 The Blue Cranes (Anthropoides paradisea) - also known as the Stanley Cranes and the Paradise Cranes - are tall, ground-dwelling cranes. They stand a little over a meter high. 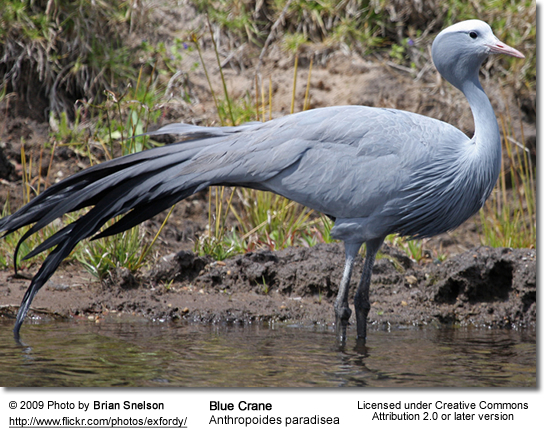 The plumage is pale blue-grey with a white crown, a pink bill, and long, dark gray wingtip feathers which trail to the ground. They usually occur in dry, grassy uplands, spending little time in wetlands areas. 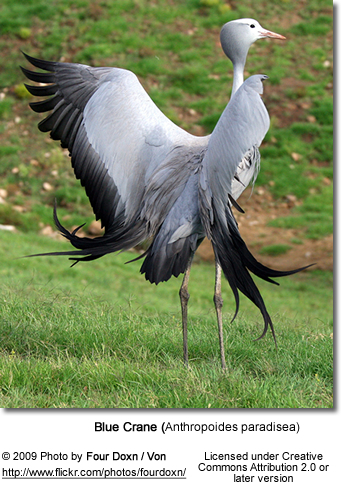 They migrate down to the lower altitudes in the winter, and move up to the higher levels for breeding. Many occupy agricultural areas. They feed on various seeds and insects. A sudden population decline startted around 1980 and with only 10,000 - 20,000 of them still remaining, they are now considered "critically endangered."